Sooo funny story about this card and a lesson here. I made this card using the umbrella die set. I used the umbrella top, the handle and the little decoration on the umbrella top. I cut all the parts out and went to put them back on the magnetic sheet. About 20 minutes later I went to put the magnetic sheet away in the stamp case ( I keep the die set with the stamp set if they are matching) and I was missing the little decoration part. I looked for over two hours. Cleaned up the table, picked up everything, went through the cards I made, kinda picked through the garbage thinking it had to be right on top. Nope nowhere. I took the garbage bag out of the can and made sure no one threw any more garbage in that bag. I was convinced it couldn't be in the garbage. Looked again for at least another hour or so. Finally, I had to take the dreaded look in the garbage. So I put on my cleaning gloves and went through the garbage, last nights spaghetti, dog hair and everything. I even went through it twice. YUCKO!!!! Nope still couldn't find it. Told my family all about my missing piece so they would keep their eyes open for it also, Nothing. I was sick about it. Fast forward to Friday and my friend Jennifer is over stamping. I told her all about my situation and how I went through the garbage, looked for hours, cleaned everything twice and still nothing. So she went to the umbrella set and shows it to me and says what piece are you missing? I said the one that is the decorative part and it is solid. She says this die? and I said no it has holes in it, she laughed and said that is so you can poke the solid image out. So I went to my catalog and it says it should have 13 dies, well guess how many dies were there, on the magnetic sheet. Yep, you guessed it all 13. Jeez, I didn't lose any and did all that work for NOTHING. So guess what I will be doing this weekend? Yep, you guessed it putting a label on my sets so I know how many pieces should be in the die set. For this card, I used the In Color Berry Burst. I love the color combination of Berry Burst, Smokey Slate, and Powder Pink. What is your favorite color combination? 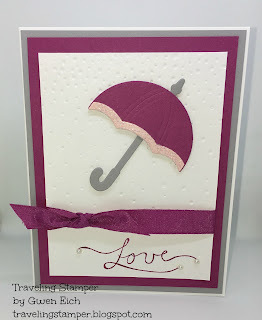 Head on over to my Stampin up web page and place your order today to make this card. List of products is listed below to make this card. Happy Stamping.